Sola Sisters: Francis Chan Rebukes Mike Gendron? 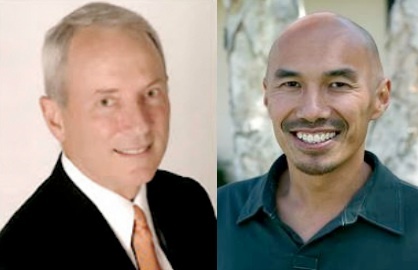 In February of 2003, Christian apologist Mike Gendron was invited by Francis Chan to give a presentation at Cornerstone Community Church in Simi Valley, CA where Chan is the pastor. Gendron is a former Catholic and founder of the ministry Proclaiming The Gospel, which is devoted to explaining why Catholic teachings and traditions are unbiblical, and simply do not line up with Scripture. After giving his presentation at Cornerstone Church, Gendron was about to go into the Q&A section of his talk when Chan came onto the stage and prevented this from happening. He also expressed to the audience his concern over having invited Gendron to speak at his church, and that he thought parts of Gendron's presentation were "cold" and "sarcastic." Tom McMahon: (H)e had this experience of going to this church and then, he was about to give a Q and A, and say, “All right, now let’s have an interaction.” (Pastor Francis Chan) stood up and said, “No!” He was offended by what Mike had to say, and he began ten minutes of apology to the audience! Wow! Dave Hunt: It’s sad that political correctness seems to rule the day. When it comes to Islam, we must be politically correct; when it comes to Catholicism, we must be politically correct. Rather let someone go to hell than offend their feelings. There is something really sad out there, Tom. Christians don’t think—we don’t recognize that truth is truth. It is black and white; you can’t compromise, you don’t dialogue with God, you don’t re-negotiate with God. The Bible has made it very clear exactly what the gospel is. It’s a matter of justice. God is the one who makes the rules. He created this universe; He created us. We’re going to have to go His way, and Jesus said, “I am the way, the truth, and the life; no man comes to the Father but by me.” But these people think that’s too narrow minded. On a personal note, I have heard Mike Gendron's presentation which contrasts Christianity and Catholicism many times, and it is hard to imagine Gendron being perceived as "cold" and "sarcastic." I'm not saying he is infallible and might not ever sin in this way, I'm just saying it's very hard for me to imagine it. As I said, I've heard Mike's presentation a number of times, and I've also listened to him be interviewed many, many times on the same topic. But please don't take my word for it: if you follow this link, you will find a number of interviews that Mike has given. Judge for yourself if he is cold and sarcastic. What you will find, I believe, is that Mike's heart genuinely is to labor lovingly, graciously, earnestly and biblically for the truth. His desire truly is to help Roman Catholics see the futility of their beliefs, and their need for the all sufficient Savior of the Bible, not the "Jesus" of the Roman Catholic teachings who give a nod to Jesus, but not his all-sufficiency. It's not enough that they claim belief in Jesus, the question is: which Jesus? The Jesus of the Bible who made full payment for our sins on the Cross? or the Catholic "Jesus" who couldn't quite get the job done, and needs us to add our works to his work on the Cross to get us to heaven? In closing, shouldn't we all, as Christians, be doing as Mike does, and laboring earnestly with the lost? After all, it is Bible believing Christians alone who have the life-giving truth that all the world so desperately needs. Being Missional The New Legalism?